LOS ANGELES — As a little girl in Iran, I loved Nowruz, the first day of spring, known as the Persian New Year. It was the only time when grown-ups seemed joyful and full of hope. Even my most morose relatives somehow came to life, revealing a sunnier side of themselves kept dormant during the rest of the year. It was like the movie “Cocoon,” except that people were rejuvenated by the arrival of spring, not aliens. Every home also had a haft sin, a colorful display of seven symbolic items meant to bring health, wealth and love. It included sprouted grains, such as lentils, that represented rebirth. The grains were prepared in advance, and the pressure was on to have a thick, healthy plate of grass by Nowruz. Nowadays, there are tutorials on YouTube, but back then, certain relatives were admired for their ability to know when and how to prepare the grains. If the grains sprouted too soon, you had moldy grass; if they sprouted too late, you had anemic blades with bald spots. The stakes were high. But my favorite part of the haft sin was the goldfish, symbols of life. 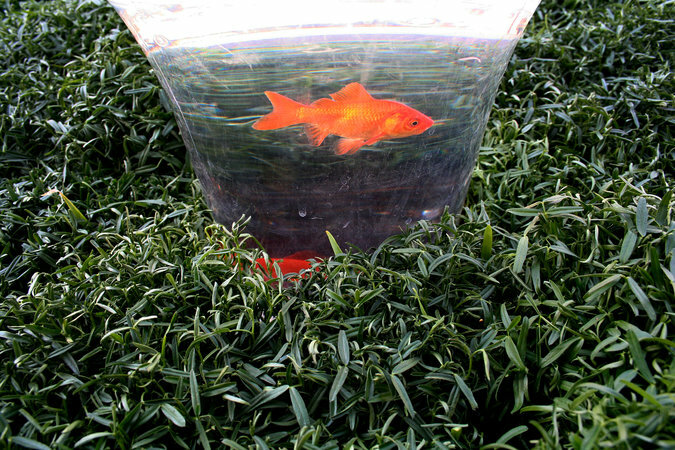 As with most pet-deprived Iranian children, these goldfish were as close as I ever got to owning a pet. I had once seen a movie about Lassie and knew that goldfish were poor substitutes for a loyal pet that could save you if you fell in a well. Nonetheless, I spent hours watching the tiny fish glide in circles, praying that they would not be floating belly up the next day. The goldfish may have represented life, but to me, they also represented disappointment. We moved to America in 1972 and soon discovered that being the only Iranians in town did not make for much of a Nowruz celebration. My parents were not particularly festive to begin with (“Everyone has a birthday. No need to make a big deal”). But it was especially challenging to feel excitement for a celebration that fell on a Tuesday between a dentist appointment and basketball practice. In the early ’80s, many Iranians arrived in the United States. Their hearts brimmed with gratitude and trepidation as they tried to navigate this new land while clinging to fragments of their past. They brought with them recipes, music and tradition. Nowruz slowly came back to life for my parents. Banners showed up in Los Angeles wishing everyone a Happy Nowruz. Some politicians even made a point of offering Nowruz greetings. My mother started setting a haft sin again. Then came 2017, and one night, while lamenting the deeply divided nature of this country, I had an epiphany. Every immigrant group has given something to this country, and we Iranians are here to present you, dear America, with Nowruz. Here is a holiday that asks only one thing of you — to have hope. It has been around for thousands of years. There is no controversy associated with Nowruz. No indigenous people were displaced, no wars were fought, and no one died for us to have this celebration. Unless winter comes up with some sordid revelation about spring, we are in the clear. While it is true that Nowruz has its origins in Zoroastrianism, one of the first monotheistic religions, who is going to argue with a religion whose maxim is “Good thoughts, good words, good deeds”? So America, please find an Iranian and, for a moment, forget about the headlines that divide us. Ask about Nowruz. You will probably be offered homemade baklava or a chickpea cookie. Please do try the chickpea cookies. They may sound strange to you, but rum balls didn’t sound all that good to me, either. And while you are wondering why the cookies melt so quickly in your mouth (it’s the chickpea flour), let’s talk. You might be surprised to find out that we have more in common than you think. That should give us all hope.